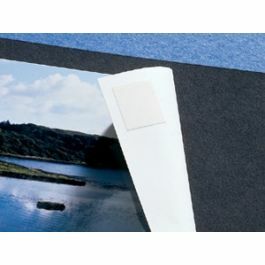 Keep your artwork and photos in pristine condition with these self-adhesive Polypropylene Clear Mounting Corners by Lineco. MC1 Mounting Corners measure 5/8" and are ideal for artwork, photography, and documents up to a 5" x 7" size. Holds light to heavyweight pieces. Pressure-sensitive corners neatly fit into place without any interference from sticky glue. Our line of Polypropylene Clear Mounting Corners by Lineco comes in several sizes in both standard and full view styles. These MC1 corners measure 5/8" and come in standard view. Pressure-sensitive and static-free, these corners make it easy to mount precious artwork, photography, documents, and memorabilia up to a 5" x 7" size. Acrylic self-adhesive is non-yellowing and does not come in contact with your work. Apply with slight pressure and press corners into mats and backing for a secure fit of light to heavyweight pieces. The corners are free from harmful chemicals and are safe to use on your most treasured pieces. This primary use of MC1 is for conservation mounting for artwork and prints up to 5" x 7".